(2) S'rî S'uka said: 'The intelligence, senses, mind and the life force of the living beings were by their Lord and Master evolved for the sake of [dealing with, being satisfied with] elementary matter, for the sake of getting a life and for the sake of the [emancipation of the] soul and its ultimate liberation. 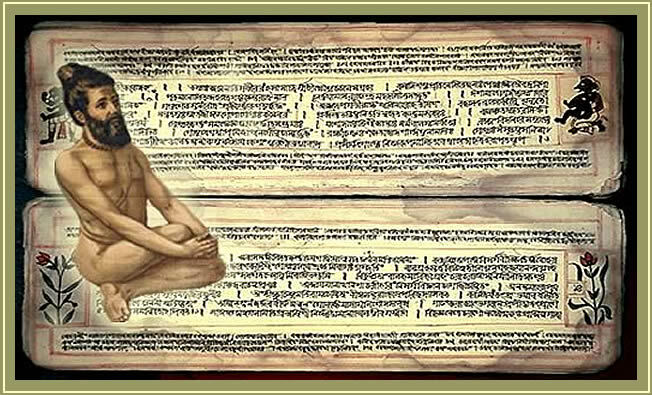 (3) The predecessors [like the Kumâras] of our predecessors [like Nârada] were fixed upon this same underlying mystery [upanishad] concerning the Absolute Truth. Whoever with faith holds on to it will be free from material attachment and attain peace and happiness [see also 8.24: 38]. (4) I will here relate to you now an account concerning Lord Nârâyana. It is about a conversation between Nârâyana Rishi and Nârada Muni. Third revised edition, loaded Januari 12, 2015. S'rî S'uka said: 'The intelligence, senses, mind and the life force of the living beings were by their Lord and Master evolved for the sake of [dealing with, being satisfied with] elementary matter, for the sake of getting a life and for the sake of the [emancipation of the] soul and its ultimate liberation. The predecessors [like the Kumâras] of our predecessors [like Nârada] were fixed upon this same underlying mystery [upanishad] concerning the Absolute Truth. Whoever with faith holds on to it will be free from material attachment and attain peace and happiness [see also 8.24: 38]. I will here relate to you now an account concerning Lord Nârâyana. It is about a conversation between Nârâyana Rishi and Nârada Muni. One day when the Supreme Lord's beloved Nârada was traveling the worlds, he went for a visit to the âs'rama of the Eternal Seer Nârâyana. From the beginning of Brahmâ's day He [Nârâyana Rishi], has just for the welfare in this and the next life of human beings who maintain the dharma, in Bhârata-varsha been engaged in penances, spiritual knowledge and peacefulness [see kalpa]. Having arrived there he [Nârada] bowed down to Him who sat there surrounded by sages from Kalâpa - the village where He resided - and asked this very same question, oh best of the Kurus. As the seers were listening the Supreme Lord related the following ancient discussion about the Absolute Truth that took place between the inhabitants of Janaloka [the world of the celibate saints]. The Supreme Lord said: 'Oh son of the self-born Lord [Brahmâ], long ago in Janaloka a sacrificial ceremony took place held by the [ûrdhva-retah] celibate sages there who had found their life in Brahmâ. You [Nârada] had left for S'vetadvîpa to see the Lord [Aniruddha]. Thereupon a lively discussion ensued [between the sages of Janaloka] about Him [Vishnu in the function of Aniruddha] in whom the Vedas lie down to rest [after the dissolution of the material world] that rose the question that you are now again asking Me. S'rî Sanandana said: 'When He [Mahâ-Vishnu] after having created this universe withdrew for the sake of its dissolution and was lying asleep, the Vedas in person awakened the Supreme One with descriptions of His characteristics, the way a sleeping king by his court poets is awakened when they as his servants approach him at dawn with [recitations of] his heroic deeds. The Vedas said: 'All glories, oh all glories to You, please Unconquerable One, defeat the eternal illusion that assumed the form of the natural modes and constitutes the [human] weakness. Because You, who in Your original status are complete with all opulences, at times engaging with Your spiritual and material energies awaken the powers of the mobile and immobile embodied beings [awake them to consciousness], You can by us, the Vedas, be supported [**]. The world we perceive is by the seers regarded as a product of something greater [of brahman], something that no more than clay [as a resource] undergoes any change itself, being transformed in forms that dissolve again. For that reason the seers dedicated their minds, words and actions to You. Where else could the footsteps of men be placed than on the ground they are walking [see also 6.16: 22, 11.24: 18 and B.G. 7: 20-25]? Your people of enlightenment, oh Master of All the Three Worlds, therefore dive deep into the nectarean ocean of narrations [about You, the kathâ] that eradicate the impurity and put an end to their troubles. It is therefore not that surprising that they who by the power of their own minds dispelled the [unwanted] qualities of the [identification with one's] temporality oh Supreme One, experience the uninterrupted happiness of Your abode in their worship. They who, like a bellows, are just displacing some air as they breathe [see B.G. 18: 61] are full of vitality [only] when they are Your faithful followers, for You, who are elevated above cause and effect, constitute the underlying reality from whose mercy the universal egg of the material complete, the separate existence [the ego] and the other aspects of creation were produced [see 3.26: 51-53]. Adapted to the particular forms of the living being, You then appear here as the Ultimate Form among the different gross and subtle physical coverings [the kos'as and B.G. 18: 54]. Among those living according to the standards of the seers, they who are engrossed in their vision worship the abdomen [the lower centers] while the Ârunis [the superior yogis] first of all fix their attention on the prânic knot of the subtle energies [see cakra] of the heart. From there oh Unlimited One, they move [their attention] upward to the head that is Your abode and then they go to the highest destination from which they, having reached it, never again fall down into the mouth of death [see also B.G. 8: 16]. Entering in a certain manner the by You differently created species of life as their motivation, You become visible depending the higher or lower form of Your own created beings, just as fire manifests itself [depending the form ignited]. You thus existing among them as the 'real' among the 'unreal', are understood as being one unchanging, equal manifestation of love ['taste'] by those who free from material entanglements have spotless minds [see also B.G. 2: 12]. The person residing within the bodies he owes to his karma is, as an expansion of You who are the possessor of all energies as is stated [by the Vedas], in fact not of the external [the gross body, the deha], nor of the internal [the subtle body, the linga] but is [by these bodies] enveloped. When scholars of the scriptures have developed faith in ascertaining the status of the living entity as being of that manifestation [as an expansion of Yours, a person], they worship Your feet as the source of liberation and the field in which all offerings are sown. By diving deep into the vast nectar ocean of the adventures of the forms that You have assumed to propagate the hard to grasp principle of the soul, the few souls who found relief from the fatigue [of a material life] do not even wish to be liberated from this world, oh Lord. This is so because they, after abandoning their homes, found association with the community of the swans [the transcendental people] at Your lotus feet [see e.g. 4.24: 58, 4.30: 33, 5.12: 16, 5.13: 21, 7.6: 17-18, 7.14: 3-4]. This body useful for serving You, acts as one's self, one's friend and beloved. They however who alas fail to delight in You, rather find the degradation of the physical frame [in successive births], in spite of You as their very Self being favorably disposed, helpful and affectionate. As a matter of fact they, failing to find their way with their great existential fears, cling to material desires and are [thus] self destructive ['soul killing'] in their worship of the unreal [see also B.G. 16: 19]. That what by the sages with their breathing, mind and senses being brought under control in steadfast yoga is worshiped in the heart, is also attained by those who remember You in enmity [see also 3.2: 24 and 10.74: 46]. We [the s'rutis] will likewise attain You and, being equally considered by You, equally relish the nectar of the lotus feet that the women enjoy [the gopîs, Your wives] whose minds are attracted to Your arms that are as firm as mighty snake bodies. They who, teaching with authority, declare that life springs from dead matter, that that what is eternal would end [see B.G. 2: 16], that the soul would not be one [see 10.14: 9] and that doing business would constitute reality [see B.G. 17: 28], they who state that the living being thus would have been produced from the three modes [see B.G. 14: 19 and 13: 28], are fixed upon a dualistic notion born from ignorance. Such a thing cannot exist in Your transcendence, in You who are the Essence of Full Perception [see also 5.6: 9-11]. The [temporality of forms and thus the] untrue threefoldness and its [mind] phenomena up to the human beings, appear in You as if they would be true. [They are illusory] but, because they are transformations non-different from Him, they are nevertheless not rejected by the knowers of the Soul, for they consider the entirety of this world as something true [viz. as Your living body]. They [these forms and also persons], created by Him who enters [His creation] in person, are for that reason recognized as being [parts and parcels] of the True Self, just as gold is not different when being assigned different forms [see also 6.16: 22]. They [only] who worship You as the shelter of all created beings do not worry about Death and simply put their feet on his head, but with Your words You tie up even the scholars [among the non-devotees] the way one ties up animals. They who consider themselves Your friends [thus] arrive at purification and not so much those who turned their face away. You are the self-effulgent causeless one [free from the senses] who maintains the power of the sensory functions of all [creatures]. The demigods together with the unborn lord Brahmâ take part in paying You tribute and partake of the offerings carried, just as the local rulers in a kingdom together with the sovereign who rules the entire country are of respect [for You] and enjoy their share. That is how they who are the appointed leaders perform their duties in fear of You. The species of life, that manifest themselves as stationary and moving, are by Your material energy motivated for action. But that can happen only when You, the One aloof, oh Eternally Liberated One, cast Your brief glance thereupon [by assuming Your forms] for having Your pastimes in the material world. To [You] the Supreme [Personality of Godhead], no one can be a stranger or a friend, just as the ether can have no perceptible qualities. In that sense You are like the void of space. If the countless embodiments of the living beings would be eternal, the omnipresent [Time] as a consequence would not be such a sovereign rule, oh Unchanging One. But it is not otherwise. Because the substance cannot be independent from that from which it was generated [ - pradhâna, the primeval ether -] [You] the regulator [who are the Time, B.G. 10: 30] must be known as being equally present everywhere [as the 'fourth dimension']. When one supposes that one knows [You materially] one is mistaken in the falsehood of an opinion [on the local order, see 6.5: 19]. The mind being conquered by the senses and the breath is like a horse not under control [B.G. 2: 60 and 5.11: 10]. Those who in this world strive for regulation but have abandoned the feet of the guru, find, being most unsteady with the various methods of control, full of distress hundreds of obstacles on their way oh Unborn One. They are like merchants [sailing] on the ocean who failed to employ a helmsman [see 10.51: 60 & B.G. 4: 34]. What do servants, children, a body, a wife, money, a house, land, vitality and vehicles mean to human beings for whom You became their very Self, the Embodiment of All Pleasure? And what at all would to those, who fail to appreciate the truth [of Him] and carry on with their indulgence in sexual matters, bring [real] happiness in this world that is subject to destruction and, in itself, is lacking meaning [see also B.G. 13: 8-12]? The seers free from false pride who, with the greatest piety, on this earth direct themselves at the places of pilgrimage and the sites of His pastimes, have installed Your feet in their heart and destroy all sins with the water of their feet. They who but once turned their mind towards You, the Supreme Soul of Eternal Happiness, will never again devote themselves to the homely affair [of a family life] that steals away a person's essential qualities. If someone says: 'From the real [of God] the real [of the universe] has manifested', that can certainly be doubted and refuted [*4]. The combination is inconsistent, for it is true in a number of cases, while it is an illusion not being so in other cases. For the sake of worldly purposes, rows of people with a dark vision like to consider it alternatively and bewilder, with different meanings and implications of Your numerous words of wisdom, those who are not using their minds with the ritual praises. Because this universe did not exist in the beginning and after its annihilation neither will exist, can be concluded that that what in-between appears within You, the sole object of love, is the untrue. We understand this universe thus as an [unreal, illusory] combination of different categories of the [real] primal substance [see text 26], while the less intelligent ones prone to falsehood, consider this mind game as real [see B.G. 6: 8]. By reason of [the insurmountable presence of] material nature, he [the living entity] reconciles himself to that undeveloped state and, in taking to her qualities [the gunas], accordingly assumes forms. Bound to those forms he is deprived of spiritual qualities and runs into [the facts of birth and] death. You Yourself on the other hand leave her [the material energy] aside like a snake that sheds its skin and are in Your eightfold greatness [see siddhis] glorified as the One Unlimited in His Glories who is endowed with all spiritual qualities. When those who restrain themselves do not uproot the desires in their hearts, they, in their impurity, cannot reach You who have entered their heart. They are like someone who has forgotten the jewel he hung around his neck. Yoga practitioners who are satisfied with an animalistic life will be unhappy in both [worlds here and hereafter]: [here about] death they cannot escape [and hereafter about] You whose kingdom they cannot attain [see also B.G. 6: 41-42]. Someone who understands You, is not concerned about the favorable or unfavorable, good or bad that is associated with the body he has assumed, neither does he care about what others say. Oh You of All qualities, day after day he fills his ears with the song that is heard in every age through the disciplic succession. For that reason the children of Manu [the human beings, see 3.22: 34-39 and 5.13: 25] consider You the ultimate goal of liberation. The Supreme Lord said: 'Having heard this instruction about the True Self, the sons of Brahmâ understood their final destination and worshiped thereupon perfectly satisfied the sage Sanandana. This is how in the past the nectar of the underlying mystery of all the Vedas and Purânas [the Upanishad philosophy] was distilled by the great souls [the classical sages] who appeared in this world to roam in higher spheres. S'rî S'uka said: 'The self-possessed rishi, thus receiving the command of the sage, accepted it faithfully, oh King. Now completely being of success he, whose vow was as firm as a kshatriya's, after due consideraton said the following. Thus having spoken Nârada bowed down to the Original Rishi [Nârâyana] and to the great souls who were His pupils. Then he went from there to the hermitage of my physical father, Dvaipâyana Vedavyâsa. He was honored by the great devotee [Vyâsa] who offered him a seat, whereupon Nârada sat down and described to him what he had heard from the mouth of S'rî Nârâyana. And thus I have answered your question oh King, on how the mind can be engaged in the Absolute Truth [- the reality] without material qualities that cannot be expressed in words. *: S'rîla S'rîdhara Svâmî elaborately analyzes this problem, of describing the inexpressible Truth in definable terms, by means of the traditional discipline of Sanskrit poetics that states that words have three kinds of expressive capacities, called s'abda-vrittis. These are the different ways a word refers to its meaning, distinguished as mukhya-vritti - literal meaning (divided in rudhi, conventional use and yoga, derived use as in etymology), lakshanâ-vritti - metaphorical meaning, and the closely related gauna-vritti, a similar meaning; exemplified by: the word lion has the three expressive forms of: it is a lion - literal, he is a lion - metaphorical and he is like a lion - similar use. So in fact the question is how the Absolute would be covered taken literal, in metaphor and in simile. **: According to S'rîla Jîva Gosvâmî, the twenty-seven verses of the prayers of the personified Vedas (Texts 14 - 41) represent the opinions of each of the twenty-eight major s'rutis. These chief Upanishads and other s'rutis are concerned with the various approaches of the Absolute Truth. See the purports pp 10.87 of this chapter of the paramparâ for specific quotes. *4: The paramparâ writes here: "According to S'rîla Vis'vanâtha Cakravartî Thhâkura, the Upanshads teach that this created world is real but temporary." The collage with Vis'vâmitra (Raja Ravi Varma) on this page is from Anand Aadhar Prabhu.